Rooting around, Pt.3: Real Rooting. 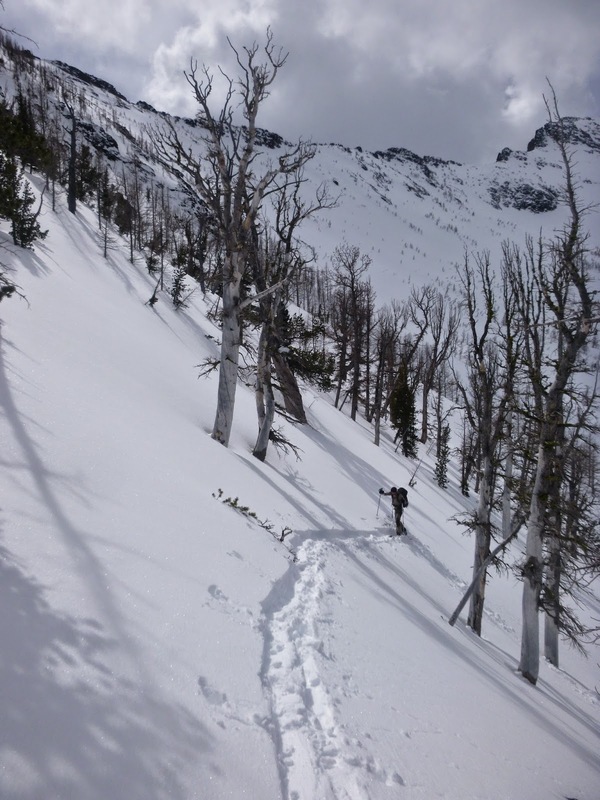 February and March were remarkable months for accumulation in the Bitterroot Mountains and the SnoTel sites in the range are reading somewhere on the order of 170% of normal for the year. Twin Lakes at least has more snow than the 2010-2011 winter. As such, the snowboarding in the Bitterroots has been exceptionally good, and I spent many days there in March and early April. Two of these tours were of particularly high quality. 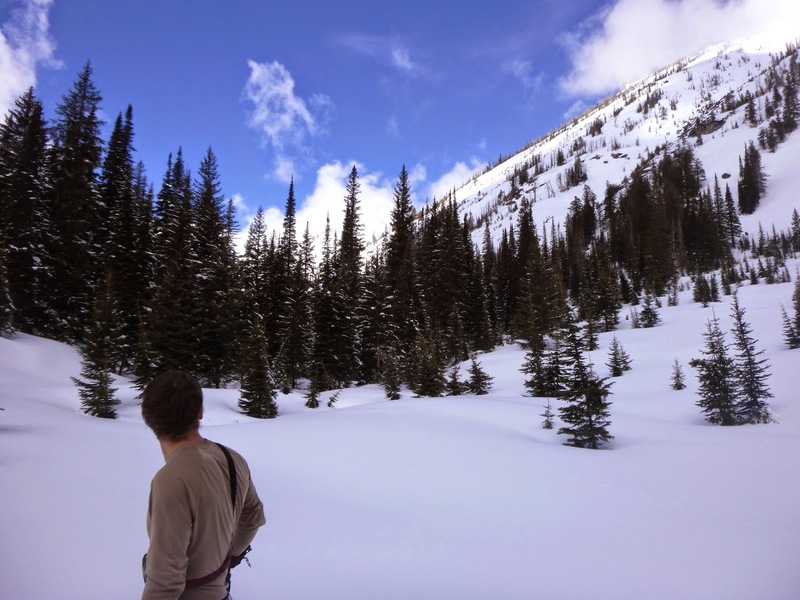 First, Mickey and I skied the southeast face of Hidden Lake Peak via the East East Mystery Chute off of Gash Point. Skinning from the end of the plowing on the Gash Point access road, we summited Gash in the usual fashion a bit over 2h30m into the day. 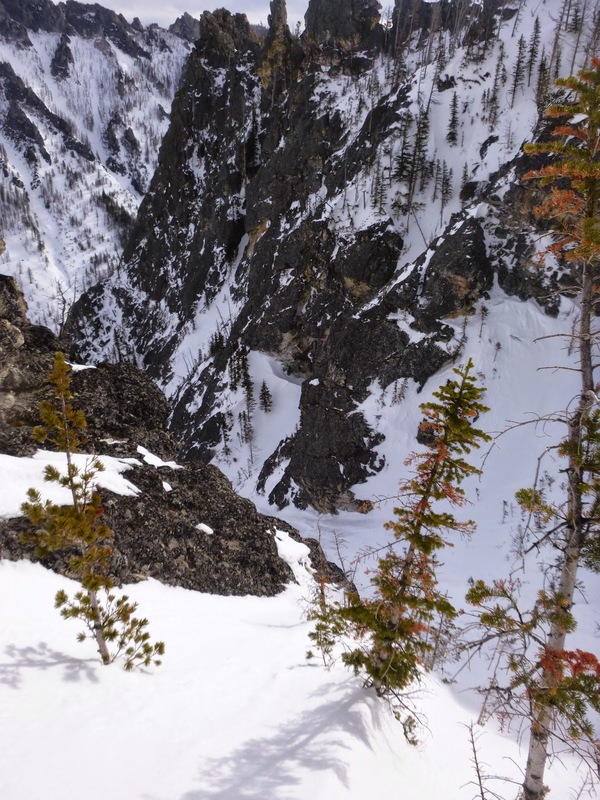 The snow quality was quite good off the north face of Gash, and we enjoyed high quality powder all the way to the shoulder separating the lower north face from the Mystery Chutes to the west. Rather than climb one of the chutelets to access the main chutes, we rolled over a small ridge into a steep and dirty couloir that goes all the way into Sweathouse. While not as elegant or long as the other chutes, this one offers easy access, and a more walled in, couloir type feel. It had slid, and the snow was firm. This may have been a first descent of the line. From Sweathouse, we skinned up-canyon for a few hundred yards before booting and harscheisening up to the Glen Lakes ridge, which we followed back to Hidden Lake Peak. The summit block was quite exposed and challenging to access, so we contented ourselves with the skier’s summit, before making the 2500′ cruise back to the bottom of Sweathouse on perfect corn. Skier’s summit of Hidden Lake Peak. Skinning up the North Face of Gash was surprisingly technical via our route, with cliffs and steep sections to traverse and climb. Also, back in the shade with wet skins, I experienced some truly epic glop, and was surprisingly pained by the time we returned to the Gash approach ridge. The egress to the truck was quick as always, despite the road skin. 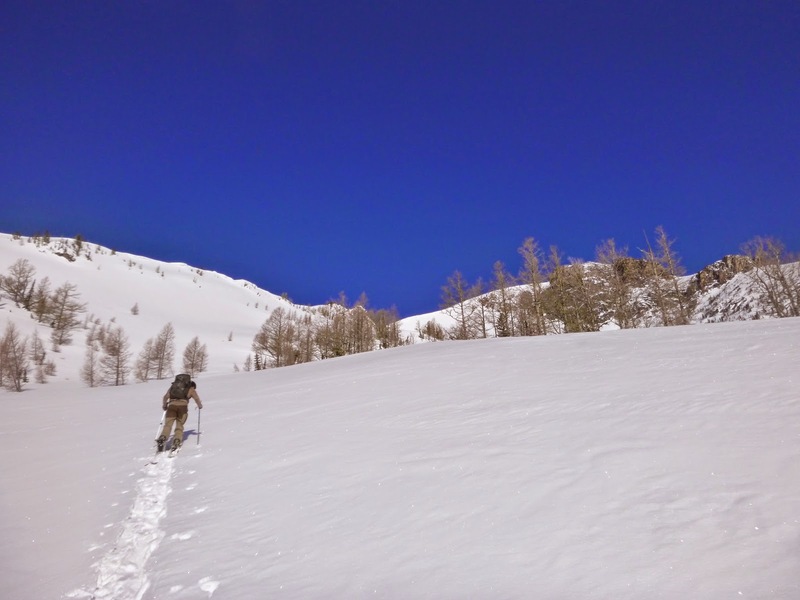 The next week, Casey and I set out with the objective of snowboarding the rarely (if ever) skied north face of Big St. Joe. 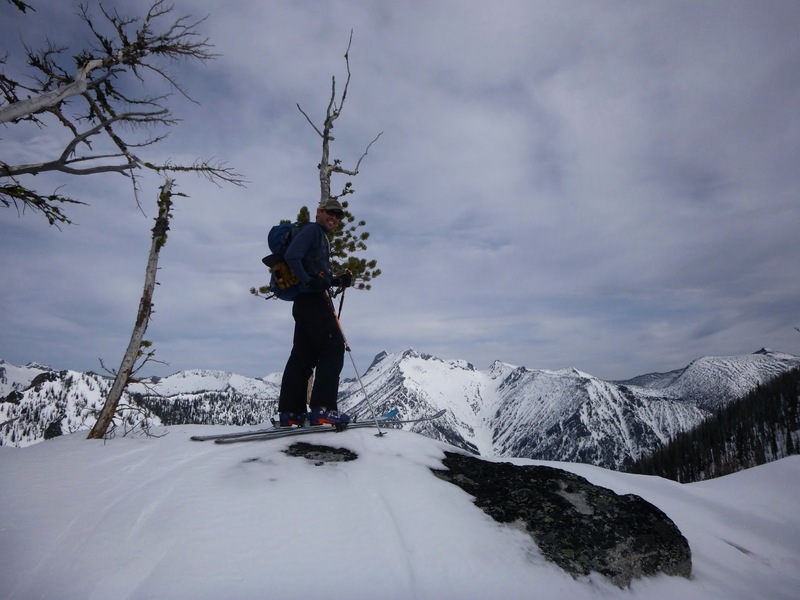 I had wanted to summit this peak in the winter for some time, and with trail conditions in good shape up Bass Creek, this was an ideal time. We set out early, and made the journey to the base of the classic Pinball Wizard Gully in 1h45m. This was fortunate, because the day was sunny and the steep and slabby boot up to St. Joe’s southeast ridge and face would have been quite sketchy in warm conditions. It was clear that the mountains were in a wet slide cycle, and Pinball Wizard had ripped recently, leaving wet slide debris strewn about its colluvial fan. 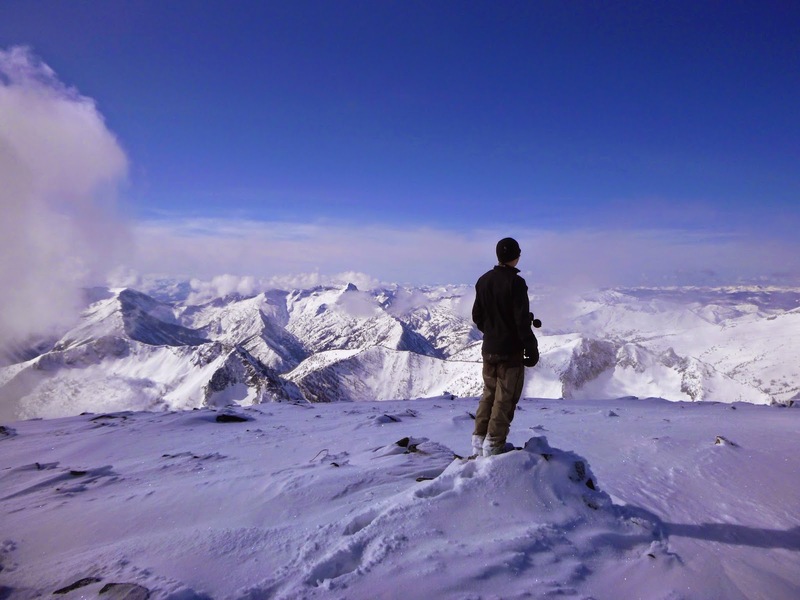 Once on the face, the going was easy, and we made good time up to the 9600′ summit. 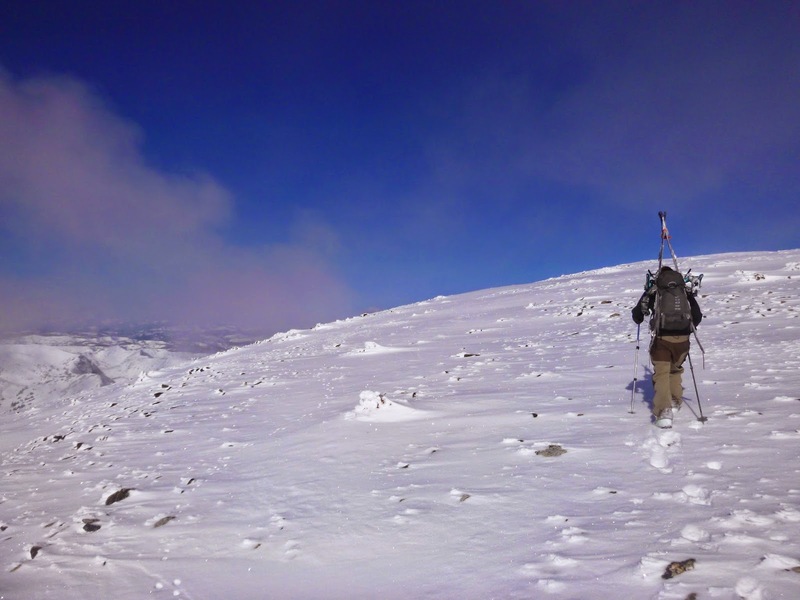 The summit plateau was mostly scoured, except for a few wind drifted pockets and a dusting of fresh snow. St. Joe is much higher than everything around it, and this is typical, as is obvious looking at it from every other summit in the area. Owing to its relatively lofty status, St. Joe also offers tremendous views. Lappi Peak, Heavenly Twins, St. Mary, Gash Point, Sky Pilot, Hidden Lake Peak, and countless visible to the south from St. Joe. The north face of St. Joe was scoured for the first several hundred vertical feet. 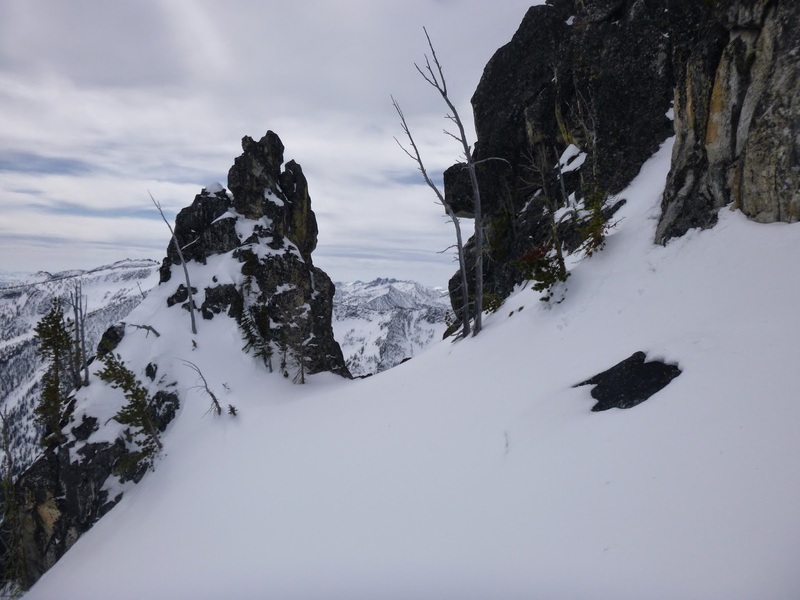 The pockets that were skiable were wind slabby and ended on talus piles. As such, we walked down the rocks until good safe snow was found, and then had a few hundred feet of quite firm riding. At a certain elevation however, the surrounding walls offered protection, and the snow transitioned to perfect moderate powder for the next 2000′ into the head of Sweeney Creek. We had considered attempting the Pyramid Buttes, at whose foot the north face of St. Joe deposits one at, but with the strong sun and recent wet slide activity, we opted to wait for another day. Endless switchbacks to the Sweeney-Bass divide. A typical Bitterroot contour put us in the basin below the east face of St. Joe. From here it was several thousand feet of glop-laden, steep, sparsely tree’d skinning to regain the ridge and the escape back to the rig. The climb was slow and even a little unpleasant as we battled fatigue, glop, and heavy snow before topping out immediately above Pinball Wizard. Having never descended that gully before, I was surprised to find it exceedingly moderate for most of its length, very likely never exceeding 30 degrees in the gully bottom. 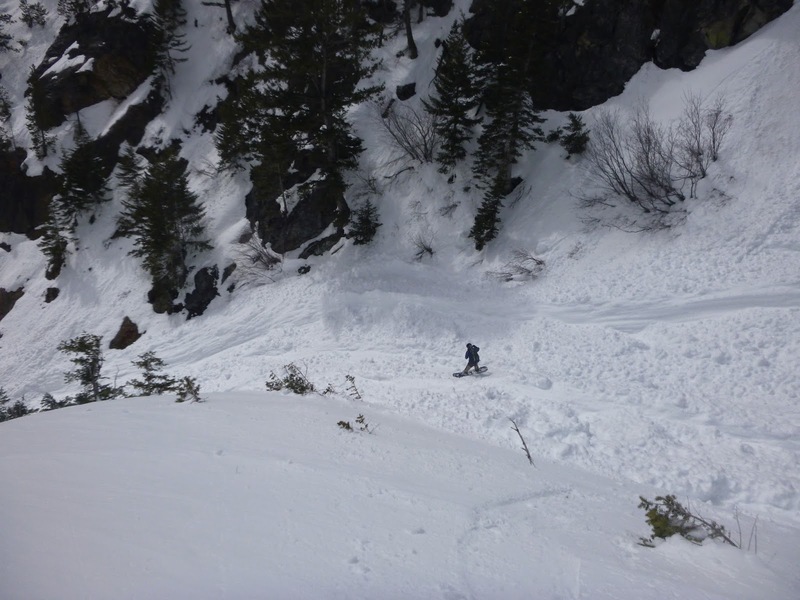 Despite the gully bottom being casual, it is the funnel for all manner of distasteful things, as evidenced by the avalanche debris at its base, and the 4 foot deep, sheer sided gouge that had been bulldozed by a large wet slide the previous day. These conditions made for difficult travel, and I was glad to be on a snowboard rather than skis, as I always feel like they are a bit more robust to these kinds of icy and choppy conditions. Casey rides the dozer track at the bottom of Pinball Wizard. The escape down Bass Creek was as fun as ever, with good coverage almost all the way back to the trailhead. It’s always amazing how fast those six miles go. Previous PostRooting around, Pt. 2: Philosophical differences in the Swan Range.Next PostSheepshead and McDonald, in the usual fashion.